We are back! It is time for you to enter our brand new test chambers, meet new characters and start the next episode of our story! Prepare to discover more secrets that are hidden in Creative Futures! Episode Two continues from the point where the first episode ends. For Episode Two we are going to make more beautiful maps, more exciting puzzles and new interesting elements! SPOILER: There is somebody waiting for you, and he will back in EP2! Our first article about new testing element - Gel Converter. Hello guys, I know that it's been a long time since our last update. The progress on Episode Two is little bit slower than we expected, mostly because Strnadik didn't get new PC, so he still can't do awesome animations. We started work on another project. 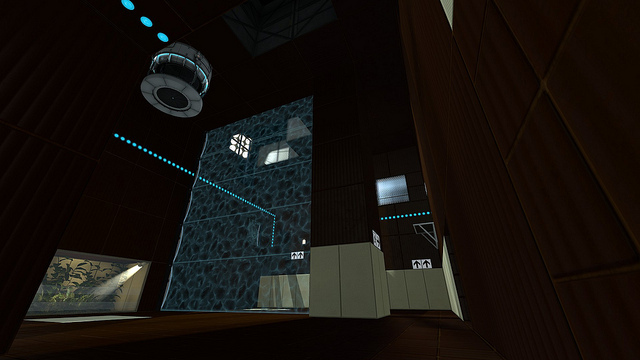 Now I can't you tell any more information, but it is going to be co-op mappack for Portal 2. Yesterday I also made a new testing element for Deep Chambers. It is gel convertor. It is really simple: blue gel goes in, orange gel goes out. It works in reverse too. Feel free to join our Steam group, where we will inform you about everything new.